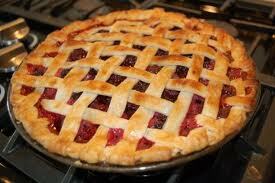 Oh how I just love blackberry pies..... so yummy yummy. All kinds but especially the fabric kind. Our Tuesday group of friends had a swap last year. a gift with it for the owner of the fat quarter. To be given whenever throughout this year. table runner Fee made for me..
and Fee for the matching fabric and the gorgeous runner. After I have finished the binding on a little girls gift quilt..
You are one lucky lady to have such beautiful friends and receive such lovely gifts. Gorgeous Pressies Dawn Love the Fabrics so Pretty. Just love all of your goodies. What fun...you have some great friends to give you such lovely gifts!! Oh. My. Gosh. !!! That pie potholder is just adorable!!!! and your pie looks so yum!! Now I am just wanting a big ol' piece of pie for myself :)! Hope you are well Dawn!